Hellooooooooo my friends! Did you think you'd never hear from me again? I have to tell you, I was kind of afraid I wouldn't be able to blog again. I have several posts in various stages of completion and I was just like....4th of July.....world going to you know where in a handbasket.....tired....why do i blog again?? But as always, there's inspiration to be found if you look, and I found it on one of my MOST favorite of blogs, Posie Gets Cozy. In this post, Alicia threw out a request asking for "cozy mysteries" and by gum, her blog readers rose to the occasion. I read every comment and realized that 1) there was much goodness to be had in all of the book suggestions and 2) I now needed to round up a great many of the books and compile them here! Also - COZY MYSTERIES? Is this really a thing? Howwwww was I unaware that this was a genre?? Let's take a peek at what I've collected. Thank you Posie readers! Ok so I'm not historically much of a mystery fan, but there are a few on this list that I've been eyeballing for years and well my lovelies, if you throw the word COZY on pretty much anything, I'm ALL IN. I've had my eye on Alexander McCall Smith's 'The Sunday Philosophy Club' for awhile, but I kept forgetting about it. Now that I have my list here, I SHAN'T forget. This is the first in the Isobel Dalhousie series, and they are supposed to be awesomely delightful. The titles of the other books are all fabulous-sounding. ('The Uncommon Appeal of Clouds' and 'The Careful Use of Compliments' anyone?) A lady-philosopher-investigator in Edinburgh. Sure why not? 'Aunt Dimity's Death' by Nancy Atherton has a ghost in the story. I don't know what else it's about, but I'm all for ghosts. A fairy tale and a mystery AND a ghost story! I think I need to read this one first. Oh and there's a secret hiding among old letters on an English country estate. yesyesyes. 'The Sweetness at the Bottom of the Pie' by Alan Bradley is the first of the Flavia de Luce mysteries, that I guess were begun as YA fiction? Flavia is "an aspiring chemist with a passion for poison". THAT SOUNDS AWESOME. The series begins with Flavia as an 11 year old science prodigy - who finds a dead body in the cucumber patch outside of her bedroom window. She has a bicycle named Gladys and two sisters named Ophelia and Daphne. I think Julia might like this soon! This whole series seems darling. Mannnnnnny of the blog comments on the Posie post mentioned the Agatha Raisin books, and the series begins with 'Agatha Raisin and the Quiche of Death'. HA HA HA, that's quite the title, yes? Agatha is a sharp tongued middle aged woman living in the Cotswolds, who has a hard time fitting in socially. 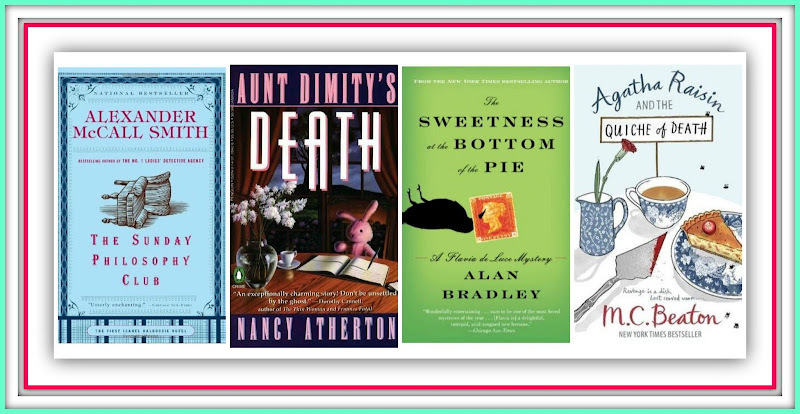 Apparently these books are considered quintessential "cozy mystery" reading, so I think if we're going to jump into this genre, we need to have these books by M.C. Beaton at the top of the list. Stephanie Barron's 'Jane and the Unpleasantness at Scargrave Manor: Being the First Jane Austen Mystery' has a mouthful of a title, but I'm a-gonna start with this one because hello, JANE AUSTEN as sleuth? A mystery about some "unpleasantness"? Alrighty. There's a whole slew of these books and they're supposedly a ton of fun. 'A Moment of Silence' by Anna Dean has a lovely cover, WHICH ALWAYS WINS ME OVER, is yet another one set in England (always a bonus for me) and features a Miss Dido Kent attempting to assist her niece, whose fiance has just run off under strange circumstances. (are there any other kind??) There's also a dead woman found in the shrubbery. HOW ANNOYING, dead bodies in the shrubbery! Who in Bellfield Hall is of suspicious character? Apparently everyone. 'Her Royal Spyness' by Rhys Bowen features a heroine who is 34th in line for the throne (we're back in Great Britain), and has the best name: Lady Victoria Georgiana Charlotte Eugenie. There's a French rogue, a Scottish castle, a murder, and 1930's England. Oh and an Irish lord. That's enough to get me to read it. Alright alright alright..... - to quote Matthew McConaughey. Am I the last one to know about this Cozy Mystery biz? If I am the last one to know, I'm totes blaming you guys for not letting me know HA HA HA HA. But seriously. Should I jump into cozy mysteries and toss all my paranormal teen romance YA books (another genre of which I was unaware for years and I was OUTRAGED that this genre didn't exist when I was a teen)?? Cheers to Cozy Mysteries!!!! Did you read Nancy Drew as a child? 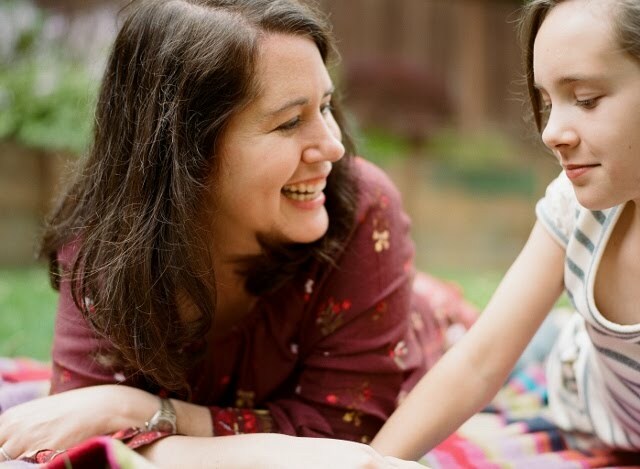 These books are for grown up fans and are perfect reading for a summer day. I've read all the available Royal Spyness mysteries by Rhys Bowen. Love them! I'll start in on some of the others on your list. Have you read Kate Carlisle's Bibliophile Mysteries? Just the right books for those who like books and wine! Ok so I read a little Nancy Drew but not a ton. I was so hypnotized by my fairy tales! And I have not read the Kate Carlisle books - off to add to the list, thank you!!! I am pretty much a cozy mystery aficionado. I LOVE cozy mysteries. They are so British. My personal favorite is Patricia Wentworth. MUST READ HER. I practically envy you getting to read all of these for the first time! I know I feel like I've been given a Christmas present or something, all these fun Brit mystery books to read! I'll go check out Patricia Wentworth asap! 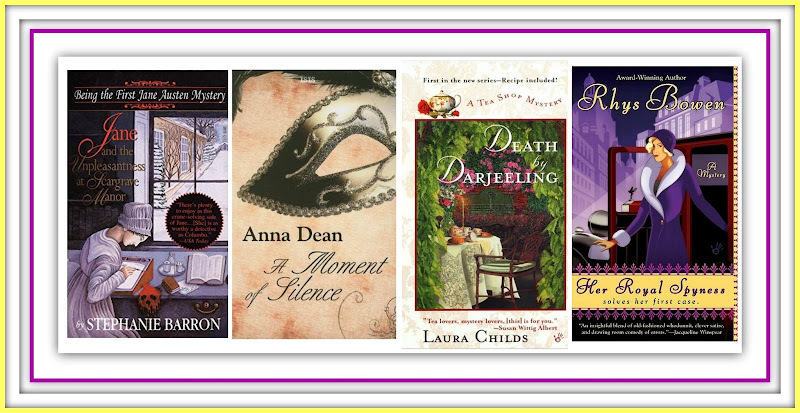 I love the Anna Dean mysteries with Dido Kent. I devour them. Have the newest one all primed and ready for vacation next week. So excited! AWESOME!!! Ok I'll start immediately!!! I always think about starting a mystery series someday. I once began the first Maisie Dobbs book, and I want to read the books on which Grantchester is based. You'd think with my childhood Nancy Drew collection I'd read more mysteries. Fun list! Ok so the Armand Gamache books were also mentioned in the Posie post and I ran out of space to put them - 9 books was going to mess up my collage LOL! Everyone raved over those! Onto the list in my head it goes! And you couldn't be a bad friend even if you tried real hard. kissies! Oh, you must jump into the cozy mysteries!! Flavia de Luce is my hero, I absolutely love the series, especially the first ones. I'm envious you are reading them for the first time! I've read all of Agatha Raisin, and I think you would also like the Hamish MacBeth series that takes place in the Scottish Highlands. I can also recommend the TV series with Robert Carlyle-not nearly enough seasons though. Oh, Hamish is also by M.C. Beaton. I just found a new (to me) author I enjoy, Marty Wingate-The Potting Shed mysteries. It has an older heroine, and it combines my love of all things English and gardens. I really like her a lot. I have also read quite a few Aunt Dimity books, I need to catch up on those! I'm excited to try some of the other recommendations-and any other authors your commenters suggest. Bethaney-I haven't read Patricia Wentworth, I will definitely give her a try. Oh I just love mysteries! I always have loved them from early Nancy Drew days! I love the other Alexander McCall Smith series, the Ladies No. 1 Detective Agency. It is set in Botswana which is so different than anything else I have read and so interesting. Likable characters and interesting smaller mysteries woven together. Love these! I read several of the Ladies No 1 Detective Agency books and loved them! I adore books set in Africa. I can't wait to get started with all of these, not sure which to choose first. I didn't know Cozy Mysteries was a thing either - but I think I am a fan of the genre already. I just LOVE the Flavia de Luce books. Whoever above compared them to Nancy Drew is exactly right, but a more sophisticated Nancy Drew with much better writing. I also really like anything by Alexander McCall Smith, but the Isobel Dalhousie series are especially nice. They are so satisfying to read - fun and thoughtful and witty. I find myself chuckling out loud when I read them, and then I have to read whole paragraphs to my husband to explain why I am laughing. I stalk my library's "New Arrivals" section for these books. I tell you. I'm really stunned at myself that I didn't realize all of these books existed. My excuse is that I've always been obsessed with fairy tales and magic and even when I became a "grownup" - I still was drawn to books about magic and the equivalent of grownup fairy tales! I'm super super super excited for all of these. People seem over the moon over the Flavia books - I'm about to hit my library HARD for a huge book stack! I get such a kick out of the occasional cozy. I wish they made more cozy mystery movies. I feel like maybe they are on the Hallmark Channel, which I don't get anymore since we abandoned basic cable, waaaaah!